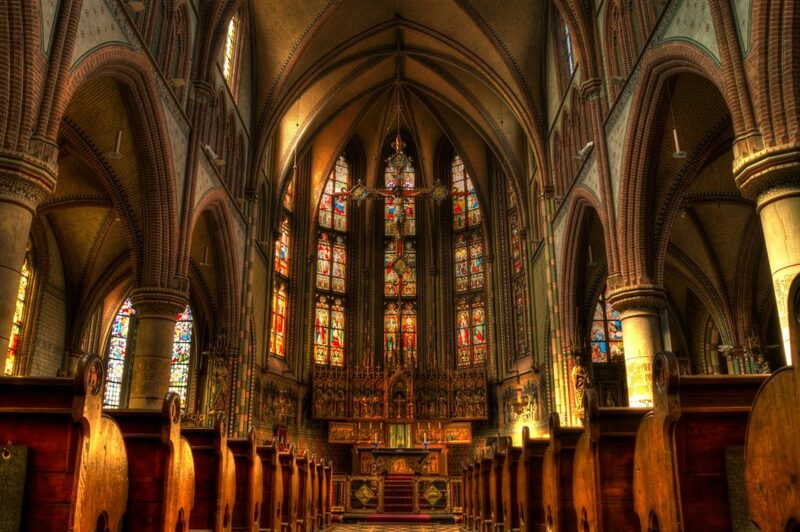 When I was a child, the church was a holy place. God was real and we worshipped him because he was great. It wasn’t until I was older that I got the notion that religion did more harm than good. Back then I believed in the Trinity, and the power of prayer, and the choir that could lift hymns up to the heavens and send down angels. I was nine years old, and I was waiting for my personal sign from Jesus Christ. I knew the rules; I had faith. All I needed was a visit from an angel, or a word from God himself. That was the rule — those who believed got a sign, and I was ready. Every Sunday I lingered in the halls, stalled in the bathroom, spent an extra moment or two putting away my acolyte robes. God hid in the walls of the church. Not in the people, but in the building itself. I knew that if I could only be alone in the stillness of the holy place I could talk to my God and for once hear him back. My little heart was greedy — I wanted to feel the magnificent space around me, all to myself. If I felt the power of God with hundreds of others milling around me, imagine how magnified, how close it would be with just me. Weeks after yearning to be alone in the pews, I lost my parents to the throngs of people leaving the sanctuary. I buried myself at the back of the room where the communion attendants couldn’t see me. I gazed in awe at the altar, and with annoyance at the few people left in the room. I teetered on this great lip of time. I couldn’t be gone for long without someone noticing, but I couldn’t ignore the pull of the great altar either. The cross seemed a thousand feet tall, the altar with its golden Bible a million pounds or more. I longed to submit to it. I fidgeted as time slowed down. My dress itched. My shoes pinched. How could I convey to these women doing their duty to the church that I needed them to leave so I could do mine? At last the final stragglers exited the sanctuary. The room felt endless. The high windows bled light onto the cross. The sun filtered dust through its rays, and the altar was awash in a pale glow. I was such a tiny girl in the face of such hugeness. I stumbled crookedly down the center aisle. I was naked and exposed. I was so afraid someone would walk in, but I couldn’t turn back. Time hung as though balanced in a cradle. All that stood between me and Christian enlightenment was a few feet of threadbare carpet tattered by the footsteps of sinners. I snuck behind the altar. I was dwarfed, shaking, and unsure what awaited me. I bowed my head and knelt to the floor in a gesture I through fitting. I touched my face to the floor and held my breath. Whispering my prayers felt too loud against the silent backdrop of emptiness. The whole bright room was mine. I was alone with God. I held a sphere of time. I bridged the world and somewhere else with my breathing. I wanted to stay until I was healed, but I feared getting caught. I feared questions. Because what could I say? I had no answers. I didn’t even have proof. All I had was the shaking of my insides, the scrambled wildness of my thoughts, and the idea that as I ran for the exit, I had done something worth running for. Marlee Head has been writing ever since she was a small child. Her favorite genres include poetry and fiction, although lately she has been experimenting with memoir and flash fiction. She will be attending the 2019 Iceland Writers Retreat in April. This is her first time being published. And THAT, Ladies and Gentlemen, is one blockbuster debut. My hat is off. And THAT, Ladies and Gentlemen, is one blockbuster debut!. My hat is off. Enjoyed this very much Marlee! Keep writing! I am in awe of you Marlee Head. First piece published and it’s incredible. I can’t wait to see what you bring to us next! A wonderfully written piece that brings majesty and emptiness closer to us all.